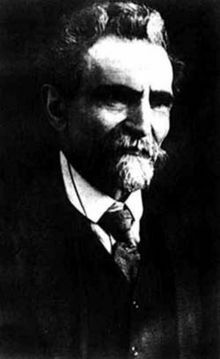 Errico Malatesta (December 14, 1853 – July 22, 1932) was an Italian anarcho-communist. What matters most is that people, all men, lose their sheepish instincts and habits that the millennial slavery inspired them, and they learn to think and act freely. Between man and his social environment there is a reciprocal action. Men make society what it is and society makes men what they are, and the result is therefore a kind of vicious circle. We follow ideas and not men, and rebel against this habit of embodying a principle in a man. Scritti: "Pensiero e volontá," rivista quindicinale di studi sociali e di coltura generale (Roma, 1924-1926) e ultimi scritti (1926-1932) [Writings: "Thought and Will," fortnightly magazine of social studies and culture general (Rome, 1924-1926) and later writings (1926-1932)], Vol. 3, p. 317; this is also quoted in the message on an Anarchist white stone monument in Pozzuoli, Italy, with simply "Gli anarchici" [The anarchists] appended to the statement. In the long run it is always the searching for a more secure guarantee of freedom which is the common factor among anarchists, and which divides them into different schools. We are for the freedom of all and for free agreement, which will be there for all when no one has the means to force others, and all are involved in the good running of society. We are for anarchy. Theoretically "democracy" means popular government; government by all for everybody by the efforts of all. In a democracy the people must be able to say what they want, to nominate the executors of their wishes, to monitor their performance and remove them when they see fit. The "government of all the people", if we have to have government, can at best be only the government of the majority. And the democrats, whether socialists or not, are willing to agree. They add, it is true, that one must respect minority rights; but since it is the majority that decides what these rights are, as a result minorities only have the right to do what the majority wants and allows. The only limit to the will of the majority would be the resistance which the minorities know and can put up. This means that there would always be a social struggle, in which a part of the members, albeit the majority, has the right to impose its own will on the others, yoking the efforts of all to their own ends. And here I would make an aside to show how, based on reasoning backed by the evidence of past and present events, it is not even true that where there is government, namely authority, that authority resides in the majority and how in reality every "democracy" has been, is and must be nothing short of an "oligarchy" – a government of the few, a dictatorship. But, for the purposes of this article, I prefer to err on the side of the democrats and assume that there can really be a true and sincere majority government. Every new idea stems from one or a few individuals, is accepted, if viable, by a more or less sizeable minority and wins over the majority, if ever, only after it has been superseded by new ideas and new needs and has already become outdated and rather an obstacle, rather than a spur to progress. We are neither for a majority nor for a minority government; neither for democracy not for dictatorship. This page was last edited on 27 December 2018, at 16:51.